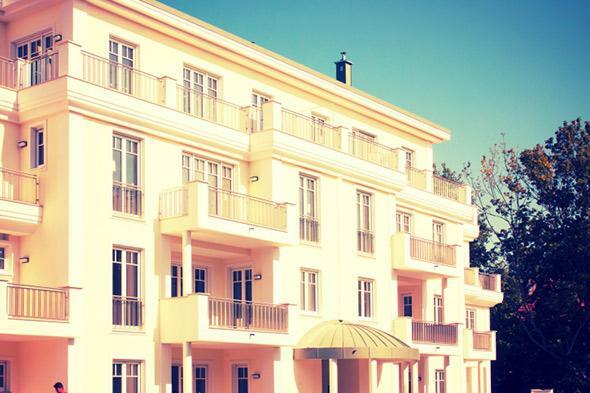 Airbnb hotel taxes: Why does the sharing economy startup want to pay them? And why some cities won’t let it. Where you see a fabulous getaway, Airbnb sees an opportunity to get in good with legislators. For Airbnb, hotel is a touchy term. The word appears exactly zero times on the company’s “About Us” page, which instead describes Airbnb as a “trusted community marketplace” and a platform that “connects people to unique travel experiences.” Airbnb doesn’t want to be seen as part of the hotel industry, so it’s positioned itself as the exact opposite. Where hotels are old, stodgy, and corporate, Airbnb hopes to appear young, fun, and personal. 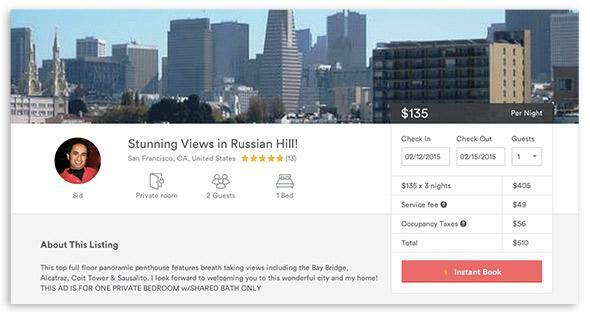 In competing against hotels, Airbnb has gone to great lengths to distance itself from them. Yet in city after city, Airbnb is also insisting that the time has come for it to embrace hotel taxes. On Sunday the company will get its wish in Chicago and Washington, D.C. when, under agreements reached with local governments, it begins to collect and remit so-called tourism taxes on its rentals in those cities. For both D.C. and Chicago, such agreements could amount to millions of dollars in additional revenue each year. In D.C. the hotel or “transient accommodations” tax equals 14.5 percent of the listing price plus cleaning fees, while in Chicago it is 4.5 percent of the same. Airbnb hosts were always supposed to submit these fees of their own accord, but not all did, many unaware that renting out a spare room could make them subject to taxes typically paid by the Hiltons of the world. Now, as part of its ongoing bid for legitimacy, Airbnb wants to make sure no one’s taxes fall through the cracks. While these might seem like picayune regulatory changes, they come at a time when Airbnb is trying to gain favor with legislators at the state and local levels across the country, as well as around the world. As it has matured from a renegade hotel alternative to a sprawling lodging network valued at nearly $13 billion, Airbnb has trained its focus on rewriting the rules of the housing and rental market. In many cities, short-term rentals of 30 days or fewer are illegal. Airbnb, for obvious reasons, would like to see this change—and it hopes that formalizing its relationship with tax collectors is the first step toward gaining broader legal acceptance. In a small but growing number of cities, this is proving the case. Hotel taxes are a small but significant revenue stream for cities that are also tourist destinations. In San Francisco the 14 percent hotel tax was projected to account for $274 million in revenue last fiscal year. Airbnb began collecting hotel taxes there last October, and the move is expected to yield as much as $11 million annually. 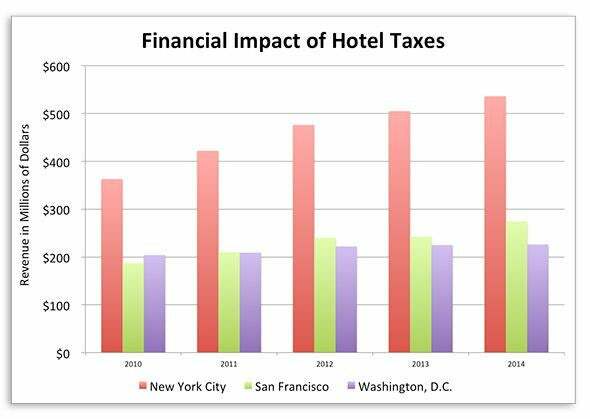 In D.C., hotel taxes contributed $226 million to city coffers in the last fiscal year, and in New York City, where the tax is 5.875 percent, they added $536 million. Chart by Alison Griswold. Data from city governments. The question of hotel taxes and Airbnb in New York is perhaps the most interesting of all. Earlier this month the mayor’s office announced that New York City made $3.7 billion in tourism-related taxes last year as 56.4 million visitors poured in from around the world. That sizeable figure presumably had little to do with Airbnb, which said last April that it could not collect and remit occupany taxes to the city and state under “current tax law.” Airbnb’s head of global public policy, David Hantman, estimated last year that if changes to the law were made, the company could contribute more than $21 million in additional revenue; this past January it upped that estimate to $65 million. “It isn’t every day that a company offers to help contribute more tax revenue,” Hantman wrote on Airbnb’s blog in 2014. What is true, however, is that in cities where Airbnb has reached an agreement on tax collection, doing so has been a precursor to important legal reforms. In late October 2014, San Francisco Mayor Ed Lee signed a law that legalized Airbnb-style home-sharing in the city—about a month after Airbnb began collecting and remitting hotel taxes. In Portland similar legislation was greenlighted in late July; Airbnb began collecting hotel taxes there at the start of that month. In San Jose a vote in December to levy the hotel tax on Airbnb guests also legalized the platform. An Airbnb ad in San Francisco includes occupany taxes in the total. For Airbnb, gaining that legitimacy could be invaluable. And for New York, which has spent years fighting a war against the platform, withholding it might be worth sacrificing $65 million.